Antidepressants increased the risk compared to placebo of suicidal thinking and behavior (suicidality) in children, adolescents, and young adults in short-term studies of major depressive disorder (MDD) and other psychiatric disorders. Anyone considering the use of nortriptyline hydrochloride or any other antidepressant in a child, adolescent, or young adult must balance this risk with the clinical need. Short-term studies did not show an increase in the risk of suicidality with antidepressants compared to placebo in adults beyond age 24; there was a reduction in risk with antidepressants compared to placebo in adults aged 65 and older. Depression and certain other psychiatric disorders are themselves associated with increases in the risk of suicide. Patients of all ages who are started on antidepressant therapy should be monitored appropriately and observed closely for clinical worsening, suicidality, or unusual changes in behavior. Families and caregivers should be advised of the need for close observation and communication with the prescriber. Nortriptyline hydrochloride is not approved for use in pediatric patients (see WARNINGS, Clinical Worsening and Suicide Risk; PRECAUTIONS, Information for Patients, and PRECAUTIONS, Pediatric Use). Each capsule, for oral administration, contains nortriptyline hydrochloride equivalent to 10 mg, 25 mg, 50 mg, and 75 mg of nortriptyline hydrochloride USP. In addition, each capsule contains the following inactive ingredients: black iron oxide, colloidal silicon dioxide, D&C Yellow #10 (aluminum lake), D&C Yellow #10, FD&C Blue #1 (aluminum lake), FD&C Blue #2 (aluminum lake), FD&C Green #3 (10, 50 and 75 mg only), FD&C Red #40 (aluminum lake), gelatin, I.M.S. 74 OP, magnesium stearate, pregelatinized corn starch, shellac, sodium lauryl sulfate and titanium dioxide. Nortriptyline hydrochloride is indicated for the relief of symptoms of depression. Endogenous depressions are more likely to be alleviated than are other depressive states. The use of MAOIs intended to treat psychiatric disorders with nortriptyline hydrochloride or within 14 days of stopping treatment with nortriptyline hydrochloride is contraindicated because of an increased risk of serotonin syndrome. The use of nortriptyline hydrochloride within 14 days of stopping an MAOI intended to treat psychiatric disorders is also contraindicated (see WARNINGS and DOSAGE AND ADMINISTRATION). Starting nortriptyline hydrochloride in a patient who is being treated with MAOIs such as linezolid or intravenous methylene blue is also contraindicated because of an increased risk of serotonin syndrome (see WARNINGS and DOSAGE AND ADMINISTRATION). Cross-sensitivity between nortriptyline hydrochloride and other dibenzazepines is a possibility. Nortriptyline hydrochloride is contraindicated during the acute recovery period after myocardial infarction. Families and caregivers of patients being treated with antidepressants for major depressive disorder or other indications, both psychiatric and nonpsychiatric, should be alerted about the need to monitor patients for the emergence of agitation, irritability, unusual changes in behavior, and the other symptoms described above, as well as the emergence of suicidality, and to report such symptoms immediately to health care providers. Such monitoring should include daily observation by families and caregivers. Prescriptions for nortriptyline hydrochloride should be written for the smallest quantity of capsules consistent with good patient management, in order to reduce the risk of overdose. A major depressive episode may be the initial presentation of bipolar disorder. It is generally believed (though not established in controlled trials) that treating such an episode with an antidepressant alone may increase the likelihood of precipitation of a mixed/manic episode in patients at risk for bipolar disorder. Whether any of the symptoms described above represent such a conversion is unknown. However, prior to initiating treatment with an antidepressant, patients with depressive symptoms should be adequately screened to determine if they are at risk for bipolar disorder; such screening should include a detailed psychiatric history, including a family history of suicide, bipolar disorder, and depression. It should be noted that nortriptyline hydrochloride is not approved for use in treating bipolar depression. Patients with cardiovascular disease should be given nortriptyline hydrochloride only under close supervision because of the tendency of the drug to produce sinus tachycardia and to prolong the conduction time. Myocardial infarction, arrhythmia, and strokes have occurred. The antihypertensive action of guanethidine and similar agents may be blocked. Because of its anticholinergic activity, nortriptyline hydrochloride should be used with great caution in patients who have a history of urinary retention. Patients with a history of seizures should be followed closely when nortriptyline hydrochloride is administered, inasmuch as this drug is known to lower the convulsive threshold. Great care is required if nortriptyline hydrochloride is given to hyperthyroid patients or to those receiving thyroid medication, since cardiac arrhythmias may develop. Nortriptyline hydrochloride may impair the mental and/or physical abilities required for the performance of hazardous tasks, such as operating machinery or driving a car; therefore, the patient should be warned accordingly. Excessive consumption of alcohol in combination with nortriptyline therapy may have a potentiating effect, which may lead to the danger of increased suicidal attempts or overdosage, especially in patients with histories of emotional disturbances or suicidal ideation. 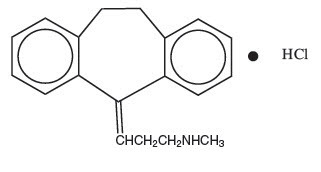 The development of a potentially life-threatening serotonin syndrome has been reported with SNRIs and SSRIs, including nortriptyline hydrochloride, alone but particularly with concomitant use of other serotonergic drugs (including triptans, tricyclic antidepressants, fentanyl, lithium, tramadol, tryptophan, buspirone, and St. John's Wort) and with drugs that impair metabolism of serotonin (in particular, MAOIs, both those intended to treat psychiatric disorders and also others, such as linezolid and intravenous methylene blue). The concomitant use of nortriptyline hydrochloride with MAOIs intended to treat psychiatric disorders is contraindicated. Nortriptyline hydrochloride should also not be started in a patient who is being treated with MAOIs such as linezolid or intravenous methylene blue. All reports with methylene blue that provided information on the route of administration involved intravenous administration in the dose range of 1 mg/kg to 8 mg/kg. No reports involved the administration of methylene blue by other routes (such as oral tablets or local tissue injection) or at lower doses. There may be circumstances when it is necessary to initiate treatment with an MAOI such as linezolid or intravenous methylene blue in a patient taking nortriptyline hydrochloride. Nortriptyline hydrochloride should be discontinued before initiating treatment with the MAOI (see CONTRAINDICATIONS and DOSAGE AND ADMINISTRATION). If concomitant use of nortriptyline hydrochloride with other serotonergic drugs, including triptans, tricyclic antidepressants, fentanyl, lithium, tramadol, buspirone, tryptophan, and St. John's Wort is clinically warranted, patients should be made aware of a potential increased risk for serotonin syndrome, particularly during treatment initiation and dose increases. Treatment with nortriptyline hydrochloride and any concomitant serotonergic agents should be discontinued immediately if the above events occur and supportive symptomatic treatment should be initiated. The pupillary dilation that occurs following use of many antidepressant drugs including nortriptyline hydrochloride may trigger an angle-closure attack in a patient with anatomically narrow angles who does not have a patent iridectomy. Safe use of nortriptyline hydrochloride during pregnancy and lactation has not been established; therefore, when the drug is administered to pregnant patients, nursing mothers, or women of childbearing potential, the potential benefits must be weighed against the possible hazards. Animal reproduction studies have yielded inconclusive results. Prescribers or other health professionals should inform patients, their families, and their caregivers about the benefits and risks associated with treatment with nortriptyline hydrochloride and should counsel them in its appropriate use. A patient Medication Guide about "Antidepressant Medicines, Depression and other Serious Mental Illness, and Suicidal Thoughts or Actions" is available for nortriptyline hydrochloride. The prescriber or health professional should instruct patients, their families, and their caregivers to read the Medication Guide and should assist them in understanding its contents. Patients should be given the opportunity to discuss the contents of the Medication Guide and to obtain answers to any questions they may have. The complete text of the Medication Guide is reprinted at the end of this document. Patients should be advised of the following issues and asked to alert their prescriber if these occur while taking nortriptyline hydrochloride. The use of nortriptyline hydrochloride in schizophrenic patients may result in an exacerbation of the psychosis or may activate latent schizophrenic symptoms. If the drug is given to overactive or agitated patients, increased anxiety and agitation may occur. In manic-depressive patients, nortriptyline hydrochloride may cause symptoms of the manic phase to emerge. Troublesome patient hostility may be aroused by the use of nortriptyline hydrochloride. Epileptiform seizures may accompany its administration, as is true of other drugs of its class. When it is essential, the drug may be administered with electroconvulsive therapy, although the hazards may be increased. Discontinue the drug for several days, if possible, prior to elective surgery. Patients should be advised that taking nortriptyline hydrochloride can cause mild pupillary dilation, which in susceptible individuals, can lead to an episode of angle-closure glaucoma. Pre-existing glaucoma is almost always open-angle glaucoma because angle-closure glaucoma, when diagnosed, can be treated definitively with iridectomy. Open-angle glaucoma is not a risk factor for angle-closure glaucoma. Patients may wish to be examined to determine whether they are susceptible to angle closure, and have a prophylactic procedure (e.g., iridectomy), if they are susceptible. Administration of reserpine during therapy with a tricyclic antidepressant has been shown to produce a "stimulating" effect in some depressed patients. Close supervision and careful adjustment of the dosage are required when nortriptyline hydrochloride is used with other anticholinergic drugs and sympathomimetic drugs. Concurrent administration of cimetidine and tricyclic antidepressants can produce clinically significant increases in the plasma concentrations of the tricyclic antidepressant. The patient should be informed that the response to alcohol may be exaggerated. A case of significant hypoglycemia has been reported in a type II diabetic patient maintained on chlorpropamide (250 mg/day), after the addition of nortriptyline (125 mg/day). The biochemical activity of the drug metabolizing isozyme cytochrome P450 2D6 (debrisoquin hydroxylase) is reduced in a subset of the Caucasian population (about 7% to 10% of Caucasians are so called "poor metabolizers"); reliable estimates of the prevalence of reduced P450 2D6 isozyme activity among Asian, African and other populations are not yet available. Poor metabolizers have higher than expected plasma concentrations of tricyclic antidepressants (TCAs) when given usual doses. Depending on the fraction of drug metabolized by P450 2D6, the increase in plasma concentration may be small, or quite large (8 fold increase in plasma AUC of the TCA). In addition, certain drugs inhibit the activity of this isozyme and make normal metabolizers resemble poor metabolizers. An individual who is stable on a given dose of TCA may become abruptly toxic when given one of these inhibiting drugs as concomitant therapy. The drugs that inhibit cytochrome P450 2D6 include some that are not metabolized by the enzyme (quinidine; cimetidine) and many that are substrates for P450 2D6 (many other antidepressants, phenothiazines, and the Type 1C antiarrhythmics propafenone and flecainide). While all the selective serotonin reuptake inhibitors (SSRIs), e.g., fluoxetine, sertraline, and paroxetine, inhibit P450 2D6, they may vary in the extent of inhibition. The extent to which SSRI TCA interactions may pose clinical problems will depend on the degree of inhibition and the pharmacokinetics of the SSRI involved. Nevertheless, caution is indicated in the co-administration of TCAs with any of the SSRIs and also in switching from one class to the other. Of particular importance, sufficient time must elapse before initiating TCA treatment in a patient being withdrawn from fluoxetine, given the long half-life of the parent and active metabolite (at least 5 weeks may be necessary). Safety and effectiveness in the pediatric population have not been established (see BOX WARNING and WARNINGS - Clinical Worsening and Suicide Risk). Anyone considering the use of nortriptyline hydrochloride in a child or adolescent must balance the potential risks with the clinical need. Clinical studies of nortriptyline hydrochloride did not include sufficient numbers of subjects aged 65 and over to determine whether they respond differently from younger subjects. Other reported clinical experience indicates that, as with other tricyclic antidepressants, hepatic adverse events (characterized mainly by jaundice and elevated liver enzymes) are observed very rarely in geriatric patients and deaths associated with cholestatic liver damage have been reported in isolated instances. Cardiovascular function, particularly arrhythmias and fluctuations in blood pressure, should be monitored. There have also been reports of confusional states following tricyclic antidepressant administration in the elderly. Higher plasma concentrations of the active nortriptyline metabolite, 10-hydroxynortriptyline, have also been reported in elderly patients. As with other tricyclic antidepressants, dose selection for an elderly patient should usually be limited to the smallest effective total daily dose (see DOSAGE AND ADMINISTRATION). Note - Included in the following list are a few adverse reactions that have not been reported with this specific drug. However, the pharmacologic similarities among the tricyclic antidepressant drugs require that each of the reactions be considered when nortriptyline is administered. Cardiovascular - Hypotension, hypertension, tachycardia, palpitation, myocardial infarction, arrhythmias, heart block, stroke. Psychiatric - Confusional states (especially in the elderly), with hallucinations, disorientation, delusions; anxiety, restlessness, agitation; insomnia, panic, nightmares; hypomania; exacerbation of psychosis. Neurologic - Numbness, tingling, paresthesias of extremities; incoordination, ataxia, tremors; peripheral neuropathy; extrapyramidal symptoms; seizures, alteration in EEG patterns; tinnitus. Anticholinergic - Dry mouth and, rarely, associated sublingual adenitis, blurred vision, disturbance of accommodation, mydriasis; constipation, paralytic ileus; urinary retention, delayed micturition, dilation of the urinary tract. Allergic - Skin rash, petechiae, urticaria, itching, photosensitization (avoid excessive exposure to sunlight); edema (general or of face and tongue), drug fever, cross-sensitivity with other tricyclic drugs. Hematologic - Bone-marrow depression, including agranulocytosis; eosinophilia; purpura; thrombocytopenia. Gastrointestinal - Nausea and vomiting, anorexia, epigastric distress, diarrhea, peculiar taste, stomatitis, abdominal cramps, blacktongue. Endocrine - Gynecomastia in the male, breast enlargement and galactorrhea in the female; increased or decreased libido, impotence; testicular swelling; elevation or depression of blood sugar levels; syndrome of inappropriate ADH (antidiuretic hormone) secretion. Other - Jaundice (simulating obstructive), altered liver function; weight gain or loss; perspiration; flushing; urinary frequency, nocturia; drowsiness, dizziness, weakness, fatigue; headache; parotid swelling; alopecia. Withdrawal Symptoms - Though these are not indicative of addiction, abrupt cessation of treatment after prolonged therapy may produce nausea, headache, and malaise. The following adverse drug reaction has been reported during post-approval use of nortriptyline hydrochloride. Because this reaction is reported voluntarily from a population of uncertain size, it is not always possible to reliably estimate frequency. Critical manifestations of overdose include: cardiac dysrhythmias, severe hypotension, shock, congestive heart failure, pulmonary edema, convulsions, and CNS depression, including coma. Changes in the electrocardiogram, particularly in QRS axis or width, are clinically significant indicators of tricyclic antidepressant toxicity. Other signs of overdose may include: confusion, restlessness, disturbed concentration, transient visual hallucinations, dilated pupils, agitation, hyperactive reflexes, stupor, drowsiness, muscle rigidity, vomiting, hypothermia, hyperpyrexia, or any of the acute symptoms listed under ADVERSE REACTIONS. There have been reports of patients recovering from nortriptyline overdoses of up to 525 mg. Obtain an ECG and immediately initiate cardiac monitoring. Protect the patient's airway, establish an intravenous line and initiate gastric decontamination. A minimum of six hours of observation with cardiac monitoring and observation for signs of CNS or respiratory depression, hypotension, cardiac dysrhythmias and/or conduction blocks, and seizures is necessary. If signs of toxicity occur at any time during this period, extended monitoring is required. There are case reports of patients succumbing to fatal dysrhythmias late after overdose; these patients had clinical evidence of significant poisoning prior to death and most received inadequate gastrointestinal decontamination. Monitoring of plasma drug levels should not guide management of the patient. A maximal limb-lead QRS duration of ≥ 0.10 seconds may be the best indication of the severity of the overdose. Intravenous sodium bicarbonate should be used to maintain the serum pH in the range of 7.45 to 7.55. If the pH response is inadequate, hyperventilation may also be used. Concomitant use of hyperventilation and sodium bicarbonate should be done with extreme caution, with frequent pH monitoring. A pH > 7.60 or a pCO2 < 20 mmHg is undesirable. Dysrhythmias unresponsive to sodium bicarbonate therapy/hyperventilation may respond to lidocaine, bretylium or phenytoin. Type 1A and 1C antiarrhythmics are generally contraindicated (e.g., quinidine, disopyramide, and procainamide). In rare instances, hemoperfusion may be beneficial in acute refractory cardiovascular instability in patients with acute toxicity. However, hemodialysis, peritoneal dialysis, exchange transfusions, and forced diuresis generally have been reported as ineffective in tricyclic antidepressant poisoning. Nortriptyline hydrochloride is not recommended for children. Nortriptyline hydrochloride is administered orally in the form of capsules. Lower than usual dosages are recommended for elderly patients and adolescents. Lower dosages are also recommended for outpatients than for hospitalized patients who will be under close supervision. The physician should initiate dosage at a low level and increase it gradually, noting carefully the clinical response and any evidence of intolerance. Following remission, maintenance medication may be required for a longer period of time at the lowest dose that will maintain remission. If a patient develops minor side effects, the dosage should be reduced. The drug should be discontinued promptly if adverse effects of a serious nature or allergic manifestations occur. 25 mg three or four times daily; dosage should begin at a low level and be increased as required. As an alternate regimen, the total daily dosage may be given once a day. When doses above 100 mg daily are administered, plasma levels of nortriptyline should be monitored and maintained in the optimum range of 50 to 150 ng/mL. Doses above 150 mg/day are not recommended. 30 to 50 mg/day, in divided doses, or the total daily dosage may be given once a day. At least 14 days should elapse between discontinuation of an MAOI intended to treat psychiatric disorders and initiation of therapy with nortriptyline hydrochloride. Conversely, at least 14 days should be allowed after stopping nortriptyline hydrochloride before starting an MAOI intended to treat psychiatric disorders (see CONTRAINDICATIONS). Do not start nortriptyline hydrochloride in a patient who is being treated with linezolid or intravenous methylene blue because there is increased risk of serotonin syndrome. In a patient who requires more urgent treatment of a psychiatric condition, other interventions, including hospitalization, should be considered (see CONTRAINDICATIONS). In some cases, a patient already receiving nortriptyline hydrochloride therapy may require urgent treatment with linezolid or intravenous methylene blue. If acceptable alternatives to linezolid or intravenous methylene blue treatment are not available and the potential benefits of linezolid or intravenous methylene blue treatment are judged to outweigh the risks of serotonin syndrome in a particular patient, nortriptyline hydrochloride should be stopped promptly, and linezolid or intravenous methylene blue can be administered. The patient should be monitored for symptoms of serotonin syndrome for two weeks or until 24 hours after the last dose of linezolid or intravenous methylene blue, whichever comes first. Therapy with nortriptyline hydrochloride may be resumed 24 hours after the last dose of linezolid or intravenous methylene blue (see WARNINGS). The risk of administering methylene blue by non-intravenous routes (such as oral tablets or by local injection) or in intravenous doses much lower than 1 mg/kg with nortriptyline hydrochloride is unclear. The clinician should, nevertheless, be aware of the possibility of emergent symptoms of serotonin syndrome with such use (see WARNINGS). 10 mg: Opaque light green cap and body, imprinted "TARO" on the cap and "NTP10" on the body. 25 mg: Opaque ivory cap and body, imprinted "TARO" on the cap and "NTP25" on the body. 50 mg: Opaque dark green cap with an opaque white body, imprinted "TARO" on the cap and "NTP50" on the body. 75 mg: Opaque dark green cap and body, imprinted "TARO" on the cap and "NTP75" on the body. Who should not take Nortriptyline hydrochloride? Do not take an MAOI within 2 weeks of stopping nortriptyline hydrochloride unless directed to do so by your physician. Do not start nortriptyline hydrochloride if you stopped taking an MAOI in the last 2 weeks unless directed to do so by your physician.